General Hospital (GH) spoilers tease that two major departures are ahead. Back when Soap Central released a blind item, GH watchers grew concerned about some fan favorites. It was revealed that some eye candy and an icon would be leaving. Ryan Paevey (Nathan) fulfills the eye candy portion of this blind item. We now know Genie Francis (Laura) is the departing icon, but it’s not a full-fledged exit. According to Daytime Confidential, Francis was bumped to recurring. It’s a move that’s leaving many GH fans outraged. Laura was gearing up for a huge campaign in Port Charles. Plenty of viewers wanted to see Laura as PC’s next mayor! Alas, after Genie Francis was demoted to recurring status, TPTB at GH made up a quick exit so Laura’s leaving to be with injured Spencer (Nicholas Bechtel) in France. She’s withdrawing her candidacy, which means Francis won’t have any episodes for a long while. Social media has been buzzing about the news of soap icon Francis losing her contract status and most of the talk blames TPTB at GH. Laura is a popular soap staple, so the demotion hasn’t gone over well. Perhaps General Hospital has some major returns in the works. They might be trying to reduce costs, but it’s a shame that Laura had to be one of the cuts. As for Ryan Paevey, it looks like he made the decision to leave. General Hospital spoilers say Nathan will get caught in some tricky Faison (Anders Hove) drama soon. Danger is definitely looming. It’s possible that Nathan will end up dead, but GH might go for a presumed death or disappearing act instead. Those would be easier to explain if Paevey ever decides to return or they opt to recast the role. Still, any exit at all is disappointing for Nathan fans. It’ll be a shame to see him go! Maxie (Kirsten Storms) will certainly have a tough time coping without Nathan by her side. Stay tuned to see how Nathan’s exit mayhem plays out. 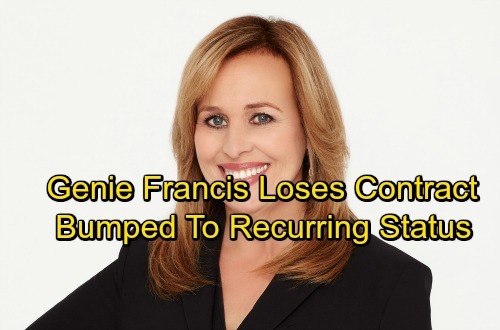 How do you feel about Genie Francis being dropped down to recurring? Do you think that’s a bad move? What about Ryan Paevey’s upcoming exit? Will you miss Nathan? We’ll give you updates as other GH details emerge. Stay tuned to the ABC soap and don’t forget to check CDL often for the latest General Hospital spoilers, updates and news.